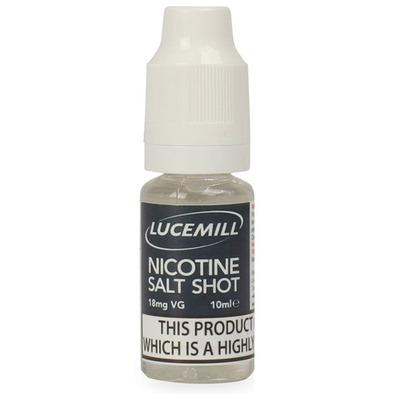 Introducing the new innovation in Nicotine Shots, the Nic Salt Shot. Salt Nicotine uses the natural salt found within the tobacco leaf as their basis for nicotine. Nicotine Salt eLiquids aim to provide a more potent nicotine hit than most eLiquids can currently provide. THIS MAX VG NICOTINE SHOT IS RECOMENDED TO USE WITH ALL OUR SHORTFILL JUICES. WHEN MIXED WILL GIVE A FINISHED JUICE WITH CORRECT RATIOS OF FLAVOUR AND VG AND PG AND OF APPRX 60ml 3mg ONLY. OUR NIC SHOT IS UK MADE TPD COMPLIANT AND REGISTERED ALL INFO CONTAINED ON THE PEEL OFF LABEL. Mixing Notes. Our non Nicotine containing liquids have been developed to take a single nic shot, or it can be vaped as it is for a extra flavour hit, or can be diluted with up to 10ml VG to make a 70vg 30pg 60ml 0mg solution for Medusa juices and an 85vg 15pg 60ml 0mg for Mf'n Donut line. If you wish to add your own nicotine shot. Add your 10ml 18mg VG liquid to the bigger bottle. Shake vigorously for 1-2 min. Leave to settle for a few minutes or until all bubbles have dissapeared. The finished bottle will be 60ml 70vg 3mg.